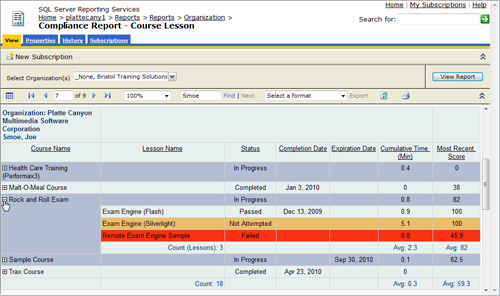 Tracker Reports gives you 101 reports and 125 charts for use in SQL Server 2008 or later Reporting Services. Each report and chart includes its own database access as well as the ability to select some or all students, courses, lessons, classes, organizations, or divisions. Many reports include "drill-down" capabilities where you can click on a parent item like a course and see child (lesson) information. 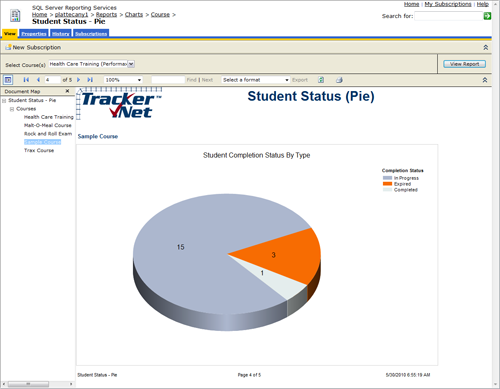 Deployment is a matter of uploading to your Report Manager and connecting to your Platte Canyon® Tracker.Net™ database. Within Report Manager, users can be given permissions to particular folders or reports, set up reports for a pre-selected organization or other items, email reports daily/weekly/monthly, and much more. Ad-hoc reporting using the Tracker Model and the SQL Server Report Builder is also included. The Tracker Reporter application connects directly to your SQL Server to give 109 reports and 118 graphs. The application is installed to your local machine and connects over the network to your SQL Server machine. You select one or more students, lessons, courses, classes, organizations, or divisions. Many reports include "drill-down" capabilities where you can click on a parent item like a course and see child (lesson) information. Users run the installation and then use a simple screen to connect to a Platte Canyon® Tracker.Net™ database. For those users with multiple instances, they can switch between report instances very simply. We are happy to show Tracker Reports or Tracker Reporter to you any time via a GoTo Meeting demonstration. Use the links to the left to join a scheduled demonstration or to request a personal one. Or send us an email at info@plattecanyon.com. You might also look at the Tracker Reports documentation or the Tracker Reporter help. Finally, we can send you a link to our Report Manager. Email us and we'll send you the URL, username, and password. Let us know if you'd like us to temporarily set you up with a report subscription as well.